We’ll have copies of all the WWE SUPERSTARS comics with us for sale. 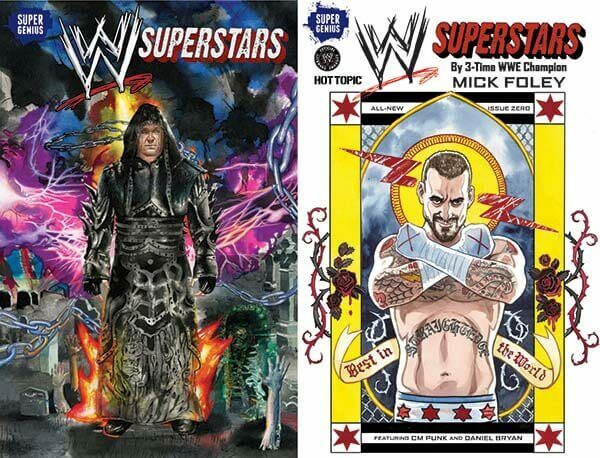 This includes ALL the variant covers for WWE SUPERSTARS #1, even the limited-edition Undertaker variant! So if you couldn’t snag your favorite cover when the book came out, now’s your chance! We’ll also have on hand copies of WWE #0, featuring Chicago’s own son, CM Punk! Not available in stores, you can not get this prequel to “Money in the Bank” anywhere else but at C2E2 booth 626*! If you’re a retailer, please take a look at our retailers page on the Papercutz site to see what exclusives we have available for you! THE Super Genius himself, editor-in-chief Jim Salicrup, and WWE SUPERSTARS author and WWE Hall-of-Famer Mick Foley will also be on a panel Friday discussing the relationship between wrestling and comics. We hope to see you there! From Peter Parker entering the ring in AMAZING FANTASY #15 to CM Punk yelling out “It’s Clobberin’ Time” on RAW, comics and wrestling have enjoyed a long joint history. Join WWE Hall of Famer Mick Foley he explores the symbiotic relationship between these subcultures. *If you’re looking for us in the directory, we’re listed under our parent company Papercutz. You won’t find Super Genius in the program.